This is a dining chair, as suggested by its shape and practical leather upholstery, which is a copy of the original covering. The chair combines two completely different styles. While the legs and seat are both based on Georgian furniture of the 1780s, the serpentine design of the back is highly innovative. A. H. Mackmurdo (1851-1942), an architect and designer, was a friend of the writer John Ruskin (1819-1900) and of the designer and writer William Morris (1834-1896). As part of his training, he studied cabinet-making and apparently made some of the furniture that he designed for The Century Guild. Although the maker of this chair has not been identified, it may have been the firm of Collinson and Lock, Oxford Street, London. Other examples of this design in the William Morris Gallery, Walthamstow, London, bear the stamp of that firm. Although it is not known exactly when this chair was designed, Mackmurdo used the same serpentine shapes on the title-page of his book Wren's City Churches, published in 1883. The Century Guild exhibited a music room at the International Inventions Exhibition in London in 1884, which included one of these chairs. The back of the chair was illustrated in the influential periodical The Builder in August 1885 and praised for its originality. Chair, made of mahogany with green leather seat. The ornate fretwork back splat is a representation of flowers and stems. This is painted in green and red, much discoloured. The upholstery was replaced for the British Galleries by Derek Balfour, using a sub frame covered with metal on to which the leather was attached. Brass nail heads are stuck around the edge of the leather to replicate the original fixed nails. The original top cover may have been green leather. The chair was designed around 1881 by Mackmurdo, the year before he founded the Century Guild. This example bears the Guild's CG monogram painted on the lower inside back, proper right (found during conservation for the British Galleries) but is thought to be an early example possibly made by Collinson and Lock. Two other chairs at the William Morris Gallery,Walthamstow, also have the monogram and one of these is stamped by Collinson and Lock, the Guild's original agents and manufacturers. The William Morris Gallery chairs also have additional iron strengthening brackets running horizontally behind the fretwork panel. 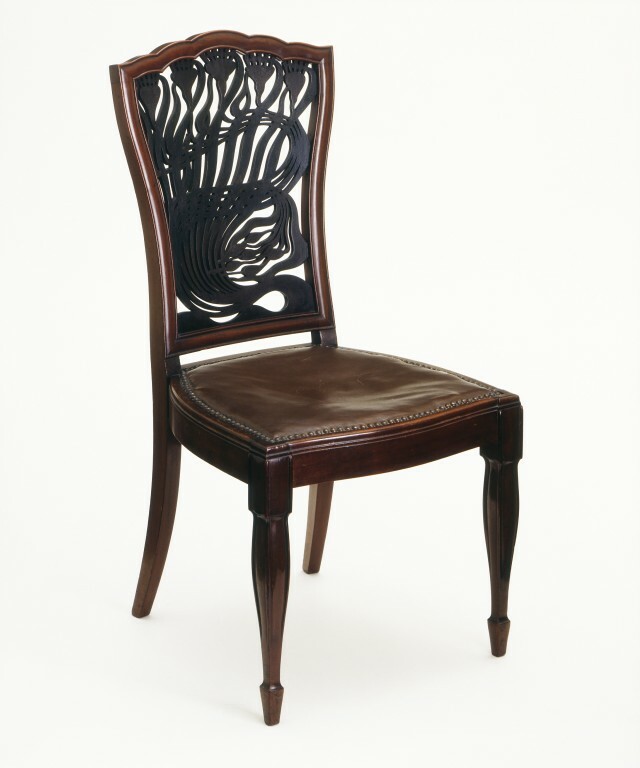 Two other chairs of the same design with the Century Guild monogram are in the collections of the Virginia Museum of Fine Art, Richmond (acquired 2003), and the Los Angeles County Museum of Art, respectively. In 1977 the V&A began negotiations with the owner of the chair, Reverend Dudley Roberts of Blackheath, about a loan. The provenance of the chair before Reverend Roberts's ownership is not recorded; neither is the date it came into his possession. He lent the chair to the Museum in 1979 and after his death in 1981 it was acquired from his heir, Mr. Prince, in 1982. Historical significance: The decorative fretwork panel in the back of the chair has long been recognised as a precursor of art nouveau. Chair, mahogany with painted back and replacement seat of green leather; designed by A.H. Mackmurdo 1881, probably made by Collinson and Lock, 1881. Art & Design in Europe and America 1800-1900. Introduction by Simon Jervis (London: The Herbert Press, 1987), illus. p. 18. The chair was made in 1881, the year before Mackmurdo founded the Century Guild. Another example in the William Morris Gallery in Walthamstow was stamped by the Guild and this dates it from 1882 or later. The serpentine design of the pierced back has often lead to this chair being published as an early example of English Art Nouveau. 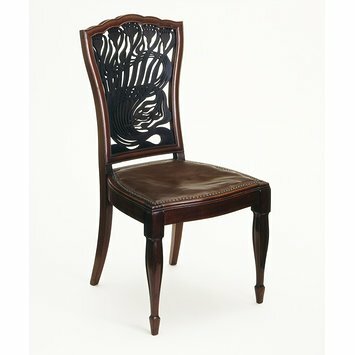 This is certainly so for the back, but the rest of the chair is totally neo-Georgian in character. Although the chair was designed in 1881, the Century Guild was not formed until the following year. During conservation work for the British Galleries the monogram of the Guild was found, painted on the inside back of the V&A chair, proper right. The similar example in the William Morris Gallery, Walthamstow, also bears the monogram of the Guild, and must therefore date from 1882 or after. This chair is also stamped by Collinson and Lock who acted as the Guild's original agents and manufacturers until 1885.